Pregnant mamas have a lot on their plate. Between doctor visits, preparing for little one’s arrival, and managing pregnancy symptoms, scheduling a routine dental visit may not seem like a priority. Plus – you might be concerned about whether it’s safe to visit the dentist. Well, we’re here to tell you – it’s not only safe but an important part of your prenatal care! 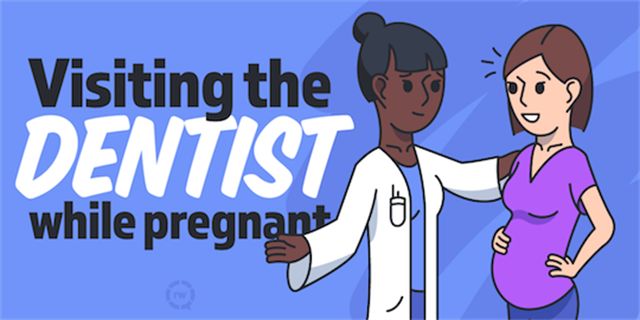 We’ve put together a quick Q&A regarding visiting the dentist while pregnant. How does pregnancy affect my mouth? Due to pregnancy hormones, you may experience pregnancy gingivitis, which can cause gum sensitivity and bleeding while brushing or flossing. In most cases, this is normal. However, it’s best to consult your dentist since periodontal disease can cause pre-term birth or low birth weight. If your dentist finds you do have periodontal disease, it is safe to receive scaling and root planing during pregnancy. Depending on how your eating or dental routine habits have changed, your teeth may be affected. Increased consumption of carbohydrates, or increased acid in the mouth from vomiting due to nausea, will put your teeth at a higher risk for decay. Some women will also experience “pregnancy tumors,” which are benign growths of tissue along the gums that may be related to excess plaque. Your dentist will be able to diagnose what’s normal or what’s not during your exam. Is a routine dental visit any different during pregnancy? Nope! According to the American Dental Association, it is safe to get your teeth cleaned and examined, and to receive any necessary x-rays that you normally would during a routine visit. Make sure to let your dental team know you are pregnant. If you are not experiencing any dental problems, and would feel better receiving x-rays after pregnancy, simply let your dental team know your preference. Can I get dental work done while pregnant? In most cases, yes. Most necessary procedures can be performed during pregnancy. It is especially important to take care of any pain or major dental issues, as the risk of infection of leaving dental work undone can affect your overall health and that of baby. If you have a high-risk pregnancy or have certain medical conditions, your physician and dentist may decide to postpone treatment until after pregnancy. Can I use local anesthesia and nitrous oxide (laughing gas) while pregnant? Low doses of local anesthesia are generally safe enough to make you feel comfortable during the procedure. The use of nitrous oxide during pregnancy is generally not recommended, as it is a “Category C” medication, meaning that there is a risk to your baby. Can I get my teeth whitened during pregnancy? Having elective procedures such as teeth whitening and starting orthodontic care are not recommended during pregnancy. This includes using at-home teeth whitening products. What are the risks of not visiting the dentist while pregnant? The health of your mouth affects the health of your body at all times, not just during pregnancy. An infection in your mouth not only puts stress on your body from the pain, but may spread to the rest of your body as well. Periodontal disease or an infection may result in low birth weight, premature birth, or even preeclampsia, a rare but life-threatening condition. So, if you’ve been putting off making that call to the dentist, put it off no longer! Go in, get those pearly whites cleaned and examined, and check it off your to-do list!